In his novel Lake Wobegon Days, Garrison Keillor describes lutefisk as "a repulsive gelatinous fishlike dish that tasted of soap and gave off an odor that would gag a goat. . . . I always felt the cold creeps as Advent approached, knowing that this dread delicacy would be put before me and I'd be told, 'Just have a little.' Eating a little was like vomiting a little, just as bad as a lot." Lutefisk, dried whitefish that's rehydrated by soaking it in water and lye, is a traditional Nordic dish that's now consumed in greater quantities in the U.S. (particularly Minnesota) than in Scandinavia. The lye soak renders the fish caustic; lutefisk is then soaked in several changes of water to remove the lye. Perhaps because of lutefisk's temporary causticity, Wisconsin specifically exempts it when defining "toxic substances" in its employee safety laws. Cosmo Goss of the Publican, who was challenged by JP Doiron (CH Distillery) to create a dish with lutefisk, didn't grow up in the midwest and had never tried it before. "I think the texture's pretty vile," he says. "It's like supergross fish goo. Like Jell-O. 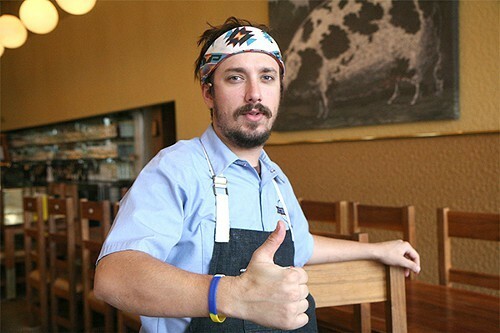 "Traditional or not, I don't know if people want to eat something that intense," he says. "Like, 'Oh, this is how they eat it in Scandinavia.' Doesn't mean it's awesome." 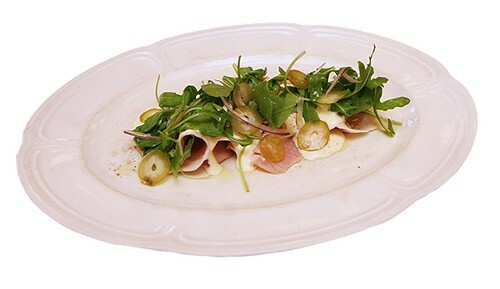 Goss prepared a variation of the Italian dish vitello tonnato, or cold veal loin with tuna mayonnaise. He poached the lutefisk in olive oil with thyme, bay leaves, and chiles de arbol, then used both the fish and the poaching oil (after it had cooled) to make a lutefisk aioli. He served the aioli with an arugula salad, truffled peach olives—immature dwarf peaches brined and preserved in truffle oil—and cold slices of poached pork loin. Goss said the finished dish was "not bad," but also wouldn't be going on the menu at the Publican. He does think the way that lutefisk is preserved is interesting, though. "I might take the method—parts of it—and use it somewhere," he says. "But I don't think I'm going to be making my own lutefisk anytime soon." Goss has challenged Sarah Rinkavage, chef de cuisine at Lula Cafe, to create a recipe with jellyfish. "I love it," Goss says. "I've tried to re-create what you get at a Chinese dim sum restaurant so many times, and I'm just really bad at it. Hopefully she has as hard a time as I did." Confit garlic in the grapeseed oil. Remove garlic and add the lutefisk, bay leaf, thyme, and chile de arbol. Let cook for 20 minutes over low heat, then let cool. In a large mixing bowl combine egg yolks, garlic, and lemon juice. Whisk very fast, once frothy start adding cooled oil from lutefisk until the sauce reaches hard peaks. If it starts to reach hard peaks before all the oil is used, thin with the water, one teaspoon at a time. Once all oil is added and you have a thick aioli, crumble the lutefisk into the sauce and season with salt and pepper. Use sauce on top of seafood or on pork or veal. Challenged to create a dish with jellyfish, Lula Cafe chef Sarah Rinkavage pickles and fries it.